Same bold branding, new boot silhouette. Nike continues to refresh its retro designs with new silhouettes that prime for the colder season. 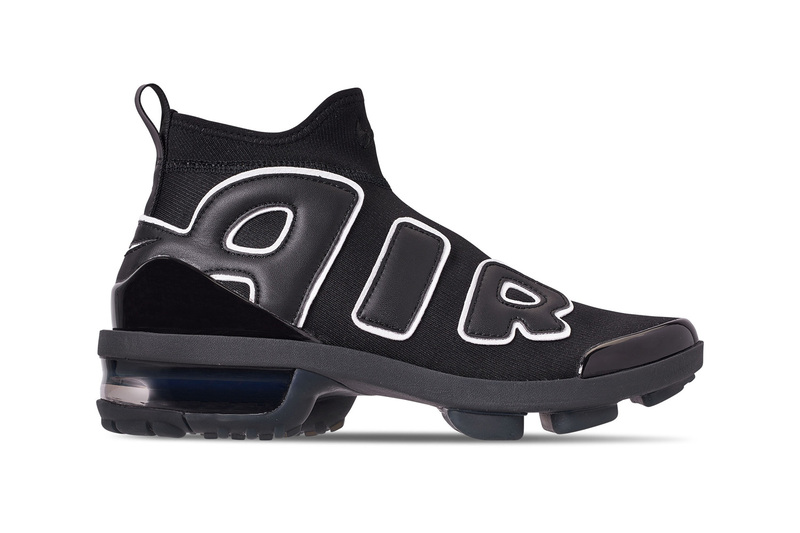 The newest model to enter is the Nike Air Quent — a hybrid of the Air More Uptempo design with a boot construction that echoes the Air VaporMax Light 2. The sneaker-boot model was actually first leaked back in April, but now surfaces in two colorways of “Burgundy Crush” and “Black/White.” It boasts a sock-like, mid-top neoprene upper that’s emblazoned with statement leather “AIR” branding. The sole unit sees a curved a similar design to that of the Air VaporMax Light 2 with a slightly different visible Air unit in the heel. Stay tuned for more release details regarding the Nike Air Quent and share your thoughts in the comments below. In the meantime, check out the Nike Air Force 270 Utility in “Sequoia/Habanero Red,” which is releasing this week. Graphic tees that link out to Wikipedia pages and cult documentaries. How many Swooshes are on these? Made using the finest solid hardwood. Straight from TNF’s ’90s archive.